As a general thing the veteran fly fisherman prefers to wade with the current and fishes the water in front of him by making diagonal casts across the stream. A good fisherman will system atically cover every inch of good water and little will be left to chance. The novice is inclined to fish his flies in a contrary manner, he casts more or less at random, and is as likely to splash the flies recklessly about in the most impossible places as he is to drop them in a favorable riffle or pool. To be able to pick out fishable water, the angler should know something about the habits of the trout, their characteristics at the several seasons of the fishing year, and their habits, which differ greatly in different streams. A fishing knowledge of the stream to be visited is of much value, but if the angler knows how to make a fair cast and possesses average skill in handling flies on water, there should be no question but that he will creel a fair number of trout even though he casts in strange waters. To imitate the action of the natural insect is the most successful manner of fishing the flies, and as the natural fly will struggle more or less when borne down with the current, the fisherman endeavors to duplicate this movement by making his artificial fly wriggle about. This motion must not be overdone, for if the flies are tw i t c h e d and skipped about, or pulled against the current, the wary trout will refuse to fall for any such obvious deceit. A gentle motion of the wrist will cause the fly to move somewhat as the natural insect will struggle. In making the cast do not cast directly down or upstream, but across the current at an angle. Let the flies fall upon the water as lightly as possible, so that the water will carry them downstream over the likely places where the trout are hiding. Keep the line as taut as possible by drawing the slack in with the left hand. The flies should not be allowed to soak in the water, neither should they be retrieved in haste. The experienced fly caster will invariably fish with a wet line, that is to say, with a slightly submerged fly, and will let the flies drag over as much water as possible before making a second cast. Owing to the fact that trout lie with their noses pointing upstream awaiting their food carried down by the current, the caster will naturally take pains to float his flies downstream with the leader fairly taut. To neglect this detail and allow the leader to float in a wide loop near or before the flies is slovenly fishing, and few trout will strike a fly presented in this amateurish fashion. Early in the fishing season, and when the stream is flooded and discolored after a heavy rain, it is a good plan to fish the flies below the surface. Fishing in this manner makes it more difficult to tell when to strike a fish, and some little practice is needed to determine the opportune moment by feeling the slight tension on the line. Many fish will be pricked to be sure, but some trout will be creeled, and fishing with the sub-merged fly is sometimes the only way trout can be taken. On fair days and in smooth water, better luck may be expected when the fly is kept upon the surface, and this is easily managed by keeping the tip of the rod well in the air. Often the fisherman can take advantage of a bit of floating foam, and if the fly is cast upon it and allowed to float with it downstream, the ruse will often prove effective. The trout is a hard striker and it is not unusual to have a trout rush ahead of the fly in his attempt to mouth it. 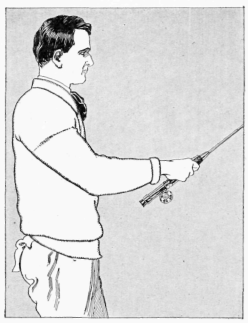 In rapid water the savage rush of the fish is sufficient to hook it securely, but when casting in quiet pools, the hook is imbedded by a snap of the wrist. At what exact moment to strike, as well as the amount of force to use, depends upon circumstances. When fishing in small streams and brooks where the trout run small, much less force is necessary to hook the fish, but in quiet water and in larger streams where 2 or 3-lb. trout are not uncommon, the fish may be struck with a smart upward jerk of the forearm and wrist. So far as my experience goes, the matter of striking is governed by the temperament as well as the judgment of the angler. 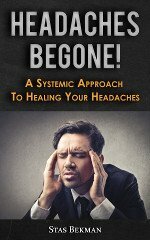 The deliberate thinking man is likely to strike too late, while the nervous individual, striking too early, is apt to prick the trout and roll him over. The best time to fish for trout is when they are feeding on the surface; and in the early days of spring, when there are few flies about, the warmer part of the day, say, from 10 in the morning to 5 in the afternoon, will prove to be the most successful time. Later on, when flies are numerous, good luck may be expected at an early hour in the morning, and in the hot summer months the cooler hours of the day may be chosen. Of course, there are many exceptions, since there are many cool days in summer, as well as exceptionally warm days in spring, and these changes of weather should be considered. However, extremes are not likely to make good fishing, and the trout will not rise as freely on cold, windy days, nor will they fight as gamely. On hot days, too, not so much luck can be expected during the hours of the greatest heat - 12 to 4 - but a good basket of trout may be creeled early in the morning or late in the afternoon of summer. A bright, clear day is usually the best for fly fishing, because the sun brings out more flies, but a warm rain, or even a fog, is also considered good fishing weather. Among the live baits available for trout fishing are the minnow, white grub, cricket, grasshopper, and other insects, and last, but by no means least, the common angle or earthworm. The minnow is beyond a doubt the most enticing morsel that can be offered to a hungry trout, and a minnow may be reckoned to secure a rise when other baits fail. The inconvenience of transporting this bait is a great drawback, and as minnows are delicate fish, a minnow bucket is necessary for their preservation. This means a lot of trouble, as the water must be frequently changed or aerated, and this labor, together with the difficulty of carrying a bulky pail through the brush, makes this desirable bait almost impossible for stream and brook fishing. The salt-water minnow, known as a "shiner" or "mummychug," is a topnotch trout bait, and being much tougher than the fresh-water minnow, makes a bait often used by anglers residing near the seacoast. The white grub, or larvae of the so-called May beetle, is a good bait available for early-season fishing, and may be obtained in the early spring months by spading up grass land. The grub is about 1 in. long, and of a creamy yellow color with a darker head. It may be kept a month, or more, by putting it in a box with a number of pieces of fresh turf. Crickets, grasshoppers, and many other insects, make good baits, while the earthworm is a good all-around bait for trout. A supply dug some days before and kept by packing in fresh moss and slightly moistening with milk and water will prove more attractive in appearance and the worms will be tougher and cleaner to handle than when carried in earth. Other good baits include the fin of a trout, and if this is used in combination with the eye of the same fish, it forms an attractive lure. In using this bait, do not puncture the eyeball, but hook through the thin flexible skin surrounding the eye. A fat piece of salt pork, cut into pieces 1 in. long and 1/4in. wide, makes a fairly good bait. 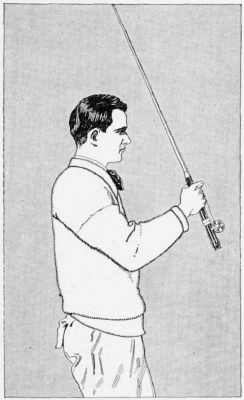 Spoons and other spinning baits are presumably attractive, but few sportsmen use them when angling for so fine a fish as trout.